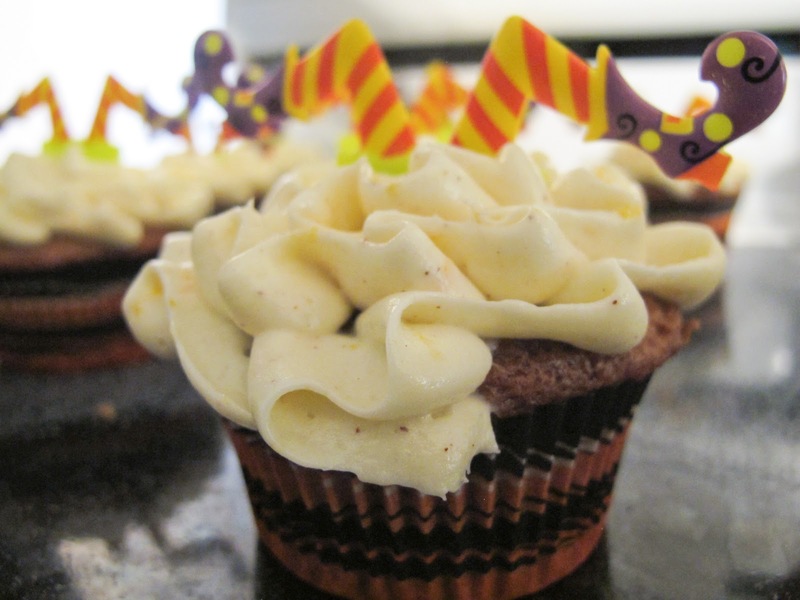 One of my favorite fall treats is pumpkin cupcakes. My mother-in-law bought really cute witch picks for a a Witches Tea Party and asked me if I would make cupcakes to go along with them, and with my obsession of pumpkin I was already planning on making these cupcakes, but this gave me an excuse to actually do it. Unfortunately, my recipes are still packed away in boxes so I had to hunt out another recipe for pumpkin cake to use this year. I whipped up some new recipes for frostings as well and all in all it turned out one wickedly delicious cupcake. I found this recipe from Annie's Eats and was pretty happy with it. I did make a few changes so I'll post my adapted recipe if you want to use it. To make the cupcakes, preheat the oven to 350°F. Line cupcake pans with paper liners. In a medium bowl, sift together the flour, baking soda, baking powder, and spices. Set aside. In the bowl of an electric mixer, blend together the pumpkin, granulated sugar, brown sugar, applesauce and oil. Add the eggs one at a time, beating well after each addition. With the mixture on low speed, add the flour mixture in two additions, mixing just until incorporated. This time I decided to fill my cupcakes with a white chocolate, cream cheese, peach, whipped cream. (That's a mouthful, but a yummy one) You'll also have left overs of this to enjoy later. In a large mixing bowl, whip cream cheese then add melted white chocolate and continue to beat until fully incorporated and creamy. In a separate bowl, beat whipping cream until soft peaks form add sugar and continue to beat. Combine whipped cream in with cream cheese mixture, and beat until fully incorporated. Stir in peaches. To fill cupcakes, I cut a circle (or you can use a small circle cutter) in the center of the cupcake. Spoon in filling and replace the tops of the cupcakes. I should say that I really do enjoy cream cheese, but haven't been a big fan of cream cheese frosting so I always alter it to suit my own preferences. So for the frosting I made a white chocolate cream cheese frosting and made ruffles to look like the pettiskirt of the witch. Whip the cream cheese and butter in a large mixer until creamy, add white chocolate and continue to cream together. Add cinnamon and orange zest and beat until fully incorporated.